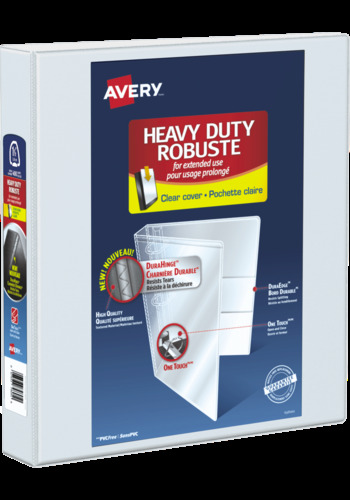 This Heavy-Duty View Binder with One Touch™ rings is perfect for extended use. From everyday referencing to classroom notes and home business use - this binder's strong enough to handle them all.The DuraHinge design is stronger, lasts longer and resists tearing, while the DuraEdge feature makes the sides and top more pliable to resist splitting. This Heavy-Duty View Binder with One Touch™ rings is perfect for extended use. From everyday referencing to classroom notes and home business use - this binder's strong enough to handle them all. The DuraHinge design is stronger, lasts longer and resists tearing, while the DuraEdge feature makes the sides and top more pliable to resist splitting. Our deep texture film offers a smoother finish and features a linen pattern for a high quality look and feel. Just pull the lever to open the rings for adding, replacing and removing pages. Then push to lock the rings in place. Even when filled to its 400-page capacity, this binder still has four stacked pockets for a bit of extra space inside.